The PTH Water Improver is manufactured with a stainless steel cylinder and within this cylinder is an alloy inner core comprising of noble and semi-noble metals. When water flows through the PTH water improver inner core weak electrical fields are generated due to the electric potential difference between the patented alloy core and the stainless steel cylinder. These electrical fields created by the PTH water conditioner prevents the adhesion and cohesion of carbonic salts, calcium and magnesium which are present in the water. Due to this the ions lose their polarity and are not able to cluster and create what we know as limescale. This is similar to what happens when using a magnetic water softener that is connected to an electric input to create the same effect. The problem however is that the polarity change does not last, the ions will return to their original polarity after a while. So when using a magnetic based water softener device the minerals that are harmful remain in the water supply. After the ions return to their original polarity the limescale will form again. The way to ensure that the water entering your system remains “soft” can only be achieved by removing the minerals from the water before it enters. This result is achieved when you use a water softener that works on an ion exchange basis, the calcium and magnesium is physically removed from your water resulting in “soft water”. The main concern is “will it work for me?” The most distressing is when you but something, pay for it and when it does not work you are minus the money you paid and stuck with a product that does not work. The first question to ask is about the guarantee and return policy. Ask beforehand what these are and make sure that you are able to return the product in the event that it does not work for you. Remember many products have a return policy, make sure you can get your money back should you not be satisfied with the result as well as how much of the purchase price you will be paid out. 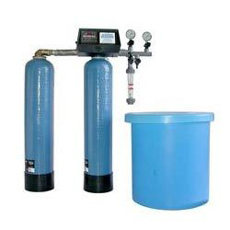 There are many different factors that will determine if a water treatment system will work for you. The chemical composition of your water is however the deciding factor as to which system will suit you best. With a complete water analysis you will be able to find out which system is best for your area.